I transplanted these two flowers growing wild from the local prairie. I really like the colors. I'm trying to cover a spot in the back yard where some bushes used to be. The right looks like a cone flower? The left I'm not sure at all but love the deep red on vibrant yellow. 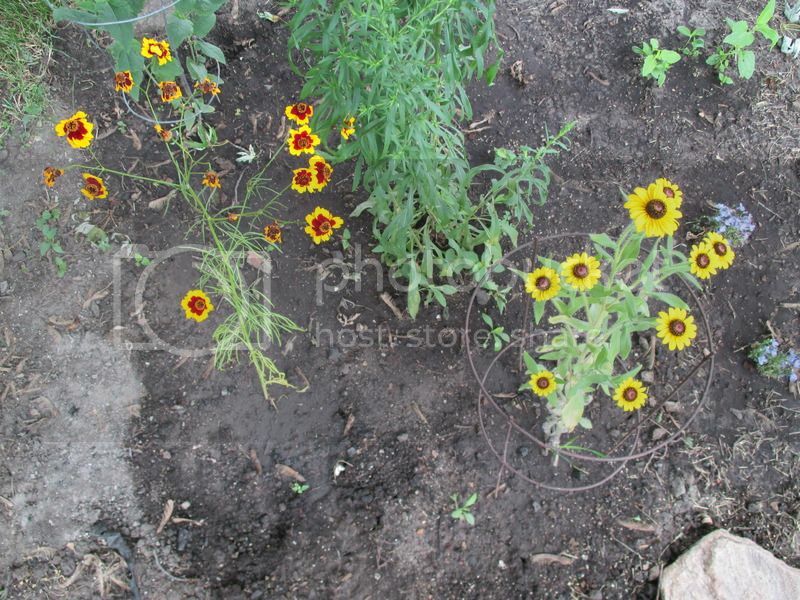 The red and yellow one is blanket flower, Gaillardia. There's lots of yellow daisy like flowers. Yours might be helenium or brown-eyed susan or I don't know. They would both be perennial. I'm not so sure the yellow one is black eyed susan. The one(upper left)is black eyed susan that I transplanted last fall and the leaves aren't the same. Either way it's nice to know they're perennials. I looked around this spring to find some nice flowers to fill in that spot but not many I like grow in mostly shade and I hope these do ok in the shade, we shall see. I never suggested black eyed susan. I said perhaps brown eyed susan or perhaps helenium or perhaps ??? different plants, though both rudbeckias. It's hard to find a typical picture of helenium, they come in so many different colors and shapes, including some that look quite a bit like your blanket flowers. But as I said, there's lots of yellow daisy like flowers. Perhaps someone else will be able to pin that one down better than I have. I've had black eyed susan on my mind since last fall, my mistake. I planted some seeds this spring but only a couple germinated. I'll have to buy some later this summer when the local green house has them. They're beautiful! !